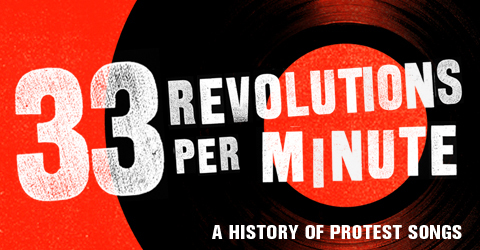 This is the blog for 33 Revolutions Per Minute: A History of Protest Songs, published in spring 2011 by Faber & Faber in the UK and Ecco in the US. I post opinion pieces, Q&As, links, deleted material and other stuff about music and/or politics. If you’d like to contact me, you can do so via the comments box here, via Facebook or via @dorianlynskey on Twitter. When pop music meets politics, the results are often thrilling, sometimes life-changing and never simple. 33 Revolutions Per Minute tracks this turbulent relationship across 33 pivotal songs that span seven decades and four continents, from Billie Holiday crooning Strange Fruit to Green Day raging against the Iraq war. It explores the individuals, ideas and events behind each song, showing how protest songs have soundtracked and informed social change since the 1930s, making their presence felt from the streets to the corridors of power. Through the work of such artists as Woody Guthrie, Bob Dylan, Stevie Wonder, Fela Kuti, the Clash, U2, R.E.M., Public Enemy and Rage Against the Machine, this expansive survey examines how music has engaged with racial unrest, nuclear paranoia, apartheid, war, poverty and oppression, offering hope, stirring anger, inciting action, and producing songs which continue to resonate years down the line, sometimes at great cost to the musicians involved. Packed with anecdote, argument and exclusive new interviews, 33 Revolutions Per Minute is an absorbing and moving document of the songs that made history. Dorian Lynskey is a music writer for the Guardian. He has freelanced for a host of titles, including Q, The Word, Spin, Empire, Blender and the Observer. He is the author of The Guardian Book of Playlists (Aurum, 2008), a collection of his Readers Recommend columns for the Guardian. Do you mind if I send you our promos? I know from your blog that this might be at the fringes of your interest but I thought I’d send it over anyway. It’ll be coming out as a free download soon over at http://www.picturesmusic.co.uk. I am writing on behalf of the organisers of 6 billion ways to invite you to speak a political conference we are organising next Saturday 5 March. I am organising a session on music and politics and as you have a new book coming out it would be great to have you on our panel. Other speakers include John Pandit from Asian Dub Foundation and Dave Randall from Faithless. Hi Dorian, you’re back was featured in Holland’s biggest public daytime talk show called De Wereld Draait Door (DWDD) (roughly translated As The World Turns). And just at the moment as i started working on the influence of the protest of 1968 on European Pop music culture for our website. I already wrote a short intro which can be read on the site http://www.europopmusic.eu and am already underway with describing France. The goal is to give a short blog about the events of 1968 for every European country and the influence it had. Mind you, this is much more blog-style then book style so the text is much more compact. Maybe you wanna help out with this series of short articles? As co-editor or something? Since you’re on the subject anyway. Hope to hear from you. I’m a features writer in Madison working on a piece on the protest music that has emerged surrounding the recent events in town (also recently read your book). Would you be up for a short email interview? Thanks much. exist for the current generation. you a few questions as I think you would be able to throw a lot of light on the subject. A telephone interview would be ideal, but I could email some questions if this isn’t convenient. Thanks for your time, I look forward to hearing back from you. I just opened a blog account where I have put my dissertation. Check the address of the website. Sorry I haven’t replied to you until today but I have been traveling (honeymoon!!). I will be back in Manchester by Sunday 1st May. Then I will be able to send you my dissertation. I can send you via email if you don’t mind or by post. My name is Natascha. I am a writer and artist in Toronto with a focus on music and social consciousness. I was wondering if I could procure a copy of your book for review on my humble blog, or on the larger blog that I write for Musicvice.com. I heard the spot on the CBC today while waiting at the doctor’s office and I love the idea. I’m a producer for Brazilian cable magazine Saia Justa, airing in Brazil on Globosat and also seen in other countries on subscription channels. The show’s New York-based correspondent Lucia Guimaraes would love to tape a brief interview with you on 33 Revolutions per Minute. I’m not sure if a visit to New York is in your plans soon, but we’d be glad to speak to you over the phone or perhaps even try something via Skype if it works for you. I can follow-up via email with samples of our work and more information. Congratulations on the book, I look forward to hearing from you. Working my way through the book at the minute – absolutely stunning piece of work. Though you might be interested in this tune – written by a group of long term unemployed folk, taking part in a creative music adult learning course at Kirkcaldy YMCA in Fife, Scotland. Inspired by the Tories welfare reforms, including the ‘work’ programme and the mandatory work placement scheme. Enjoy and thanks for writing a cracking book. Though this one also might also float your boat – skint folk from Fife (and female too) get the hump about the bankers who are evidently ‘wankers’. Track 3. All tracks written performed and recorded by skint doleybums with nothing better to do than revolt against the situation they find themselves in, rank capitalism and corrupt bankers. Hi Dorian – I have a monthly column about music & society in a weekly supplement that gets published with three Afrikaans newspapers, Beeld, Burger & Volksblad here in South Africa. My most recent column that was published this past Saturday focused on your exceptional book as well as my own detention by the police during the apartheid era. I honed in on Victor Jara and the headline was “To sing of freedom”. Here is a link (unfortunately in Afrikaans, but I can provide a rough translation if you are keen): http://www.beeld.com/By/Nuus/Om-van-vryheid-te-sing-20110624 . I’m sure I’m not the first on this, but I believe the more likely source of “This Land Is Your Land” is “When the World’s on Fire”, also by the Carter Family. Really enjoying the book …. I’m a recent music graduate, with a passion for musicology. I find your writing for the Guardian Music Blog most interesting, especially the entry on Ramy Essam. Just wondered if there were any writers that inspired you and if there are any books in particular (as well as your own of course) that you would recommend for further research into Music and Politics? Any recommendations would be most helpful. I have included my email address. Listening to Iggy Pop advertise insurance in between ‘Of Walking Abortion’ and ‘Sleep Now In the Fire’ sheds a certain kind of enlightenment on the nature of rebellion in the 21st century, anyhow. I’m launching a series of EPs in support of the Tax Justice Network and the microfinancing charity Kiva. I thought you might be interested in hearing the music. Contact me for a story please – my email address should be displayed. Thank you! My comment about the left’s hypocrisy over getting outraged at David Cameron’s tourettes comment while defending Diane Abbott’s comments and telling people to stop being offended about it has been deleted. So much for Lynskey’s “I don’t delete comments” policy. Must be to cover up obvious double standards. Hello Dorian, I’d love to send some music your way from my record label. Please me up with the info on how to send it your way. Peace. I am currently a student at Stoneham High School in Massachusetts and am working on a National History Day project on the impact that protest music had on American Society in the 60’s and 70’s. I am still waiting to receive your book, but would be incredibly appreciative if someone you would be able to answer a few questions via email, facebook, or phone on this topic. Thank you for your time, I look forward to hearing from you. means understand. It sort of feels too complex and extremely extensive for me. I’m having a look ahead to your subsequent submit, I will attempt to get the dangle of it! Thank you for 33 revolutions per minute. It has become on of my favourite albums during the last year. For a long period of time politics seemed to have vanished out of modern music. It seems that stars in the music world are only caring about money and more money. It seems like a political expression is always threatening your career not making you more authentic. Therefore it is good that we are reminded of the old virtues of a good rocking protest song! Dear Mr. Lynskey: We used your book as our summer read for the AP United States History class at our school. We are in the middle of discussing your book and listening to some of the music mentioned in it. We’d love a chance to talk with you as a class via skype (we are in Michigan, USA) if you have any availability. Thank you. Really like your page and what you’re doing. Were a duo from Cambridgeshire called The Woodleys. We’d love to do a session for you! Or better still feature in your blog or be reviewed, we have spent a lot of time and put a lot of emotion into this new project and would love for you to hear it. Hello Dorian! I’ve decided to read and follow 10 interesting and new blogs a day every day of May 2015, and yours is today’s #9! Feel free to come visit me when you can at http://www.thatssojacob.wordpress.com, and follow if you like what you read. Happy new year and happy blogging! Hi Dorian, happy new yr! I am overwhelmed to be sending you my experimental dance music work. It consists of a composed anthem infused with dance music, I hope you might consider listening to it. I will forward any additional materials on your request. Thanks a bunch for taking your time. My name is Hayden Winkler. I am currently doing a National History Day project on how Bob Dylan took a stand against organized violence and racism and for social justice through his song writing in the early 1960s. I’ve read through 33 Revolutions per Minute, and it has plenty of information on Dylan, but I would love to get a chance to ask you some specific questions either through here or through email. I would be very grateful to hear back from you. Thank you for your consideration. Thank you so much for writing 33 Revolutions per Minute A History of Protest Songs! I am currently reading and using it as research for my National History Day project on Bob Dylan and his protest music. I was wondering if you had any more commendation or information on Bob Dylan that I could utilize and attribute to you in my project. Thank you so much!! My name is Joseph Darowski and I am trying to contact you regarding an interview you did with Chris Claremont regarding his work in X-Men comic books. I’m seeking permission to republish that interview, which I found here (http://www.empireonline.com/movies/features/x-men-wolverine-jean-grey-chris-claremont-five-key-storylines/) in a collection of Chris Claremont interviews that is being published by an the University of Mississippi Press. I’m going to straight with you. I am writing a paper for my history class and I need help:) What do most people say their opinion is on your book 33 Revolutions? Sorry I don’t understand the question. Are you asking me what people think about my book? The ones I hear from like it. The ones who don’t like it must be too polite to tell me.